The primary political issue facing President Mohamed Abdel Aziz and his administration is: terrorism. Aziz aquired power via a coup in August 2008, deposing the democratically elected president, Sidi Ould Cheikh Addallahi, alienating relations with foreign countries. 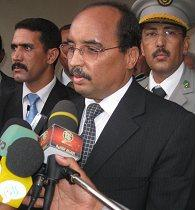 Aziz has since rekindled those ties by promising to eradicate terrorists from Mauritania. Just days after his official inauguration in August 2009 and in response to the planned terrorism campaign, terrorists implemented the country's first-ever suicide bombing. Domestically, the support for an anti-terrorist campaign has been less enthusiastic. The opposition Alliance Populaire Progressiste (APP) has been critical of the government's methods when dealing with Al-Qaeda in the Islamic Maghreb (AQIM). APP leader and parliamentary speaker Messaoud Ould Boulkheir has denounced Aziz's unilateral decision making, particularly in the creation of border posts along the boundary with Senegal, and his criticism of Malian President Amadou Toumani Toure. The Mauritanian government has carefully increased the frequency of cross-border counter terrorism raids in 2011. There were joint initiative operations between Mauritania and Mali in 2010 which led to open consternation from the Mailian side because of fatalities inflicted upon its' citizens. AQIM has accused the Malian government of aiding and abetting France after five Frenchmen were taken hostage in Niger and transported to Mali in September 2010. However, for all of Aziz's hardline approach to eliminating AQIM cells, he has espoused a more subdued approach at home. One initiative involves the training of religious scholars to go to the prisons to converse with inmates. In September 2010, Aziz granted amnesty to three dozen reformed Islamist terrorists. Diplomatic relations with the United States are good, and the government anticipates greater cooperation on counter terrorism efforts in the near future. The US ambassador-designate, Jo Ellen Powell has mentioned the possibly of the US to support the Trans-Sahara Counter Terrorism Partnership as the primary action to combat Islamist extremism. The government in Nouakchott is also planning a major offensive against arms and drug trafficking in the country. According to the United Nations Human Development Index Mauritania ranks 154th out of 182 countries, and the country may only acheive 6 out of 11 targets for the Millennium Development Goals by 2015. However, a late 2010 assessment by the International Monetary Fund (IMF) exhibits indications of encouragement, showing that the governement has begun to implement structural reforms that should yield sustainable economic growth. The IMF predicts that growth will reach 4.7% in 2010 and 5.1% in 2011, which will be made possible by strong copper and iron prices and an improvement in revenue collection. Agriculture and construction are also leading contributors to the country's economic growth. The mining sector holds considerable potential, which will probably keep investors interested as the global economic recovery increases demand for resources. The Taoudeni Basin has promising natural gas reserves, and France's Total was examining the results of its hydrocarbon finds on the Block Ta8 in late 2010. To improve Mauritania's export capacity, the government is funding several new port upgrades. The Chinese government is financing the construction of a new quay at the port of Nouakchott, while the African Development Bank and the European Investment Bank have put their funds behind the extension of the mineral port at Nouadhibou. Mauritania maintains an embassy in the United States at 2129 Leroy Place NW, Washington, DC 20008 (tel. 202-232-5700, fax 202-232-5701) and a Permanent Mission to the United Nations at 211 East 43rd Street, Suite 2000, New York, NY 10017 (tel. 212-986-7963, fax 212-986-8419).